CIDEM wins the World Habitat Award"
“Ecomaterials in social housing projects” that EcoSouth partner CIDEM has been implementing in Cuba since the year 2000 is the winner of the prestigious World Habitat Award that will be presented during the "World Habitat Day" festivities in Den Haag (Netherlands) and Monterrey (Mexico) at the beginning of October. The project produces EcoMaterials in various Cuban municipalities and has allowed 2332 families to repair or reconstruct their houses or apartments during the past five years. Read more: CIDEM wins the World Habitat Award"
Gilbert is the strongest hurricane in Jamaican recorded history (wind speeds to 320 km/h). Many roofs suffered serious damage, but the Golden Age Home in Kingston´s Trench Town became a refuge for neighbors whose tin roofs had flown away. Its Micro Concrete Roof resisted well and only five tiles on the open overhang were lifted. It must be stressed that these tiles were not properly fixed as recommended, even worse, the wire loops were not nailed down! After Hurricane Mitch devastated much of Central America, EcoSouth colleagues Grupo Sofonias Nicaragua, EcoVide Honduras and CIDEM Cuba became involved in post-disaster reconstruction. 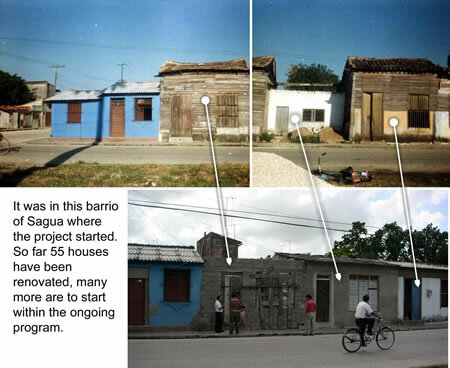 Three weeks after Hurricane George ravaged the Dominican Republic in September 1998, EcoSouth colleagues from Ecuador and Honduras visited houses built with EcoMaterials and encountered the great majority in good condition.